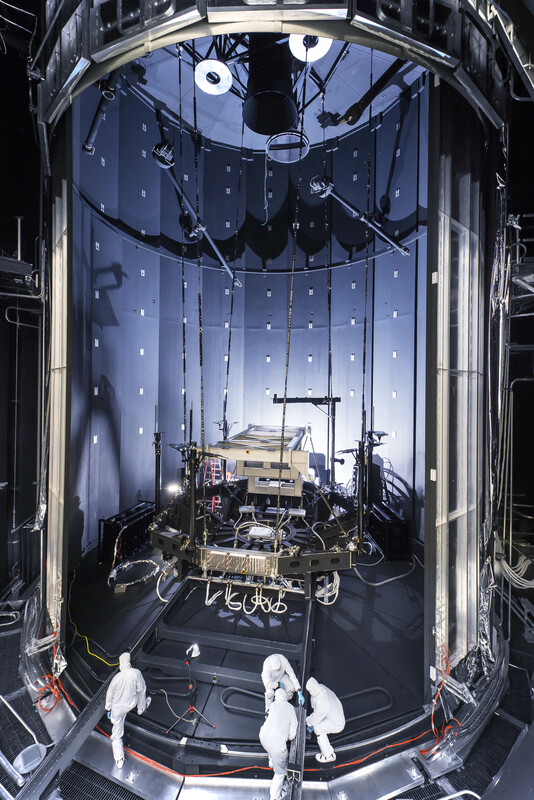 This photo was captured from outside the enormous mouth of NASA’s giant thermal vacuum chamber, called Chamber A, at Johnson Space Center in Houston. Previously used for manned spaceflight missions, this historic chamber is now filled with engineers and technicians preparing a lift system that will be used to hold the James Webb Space Telescope during testing. 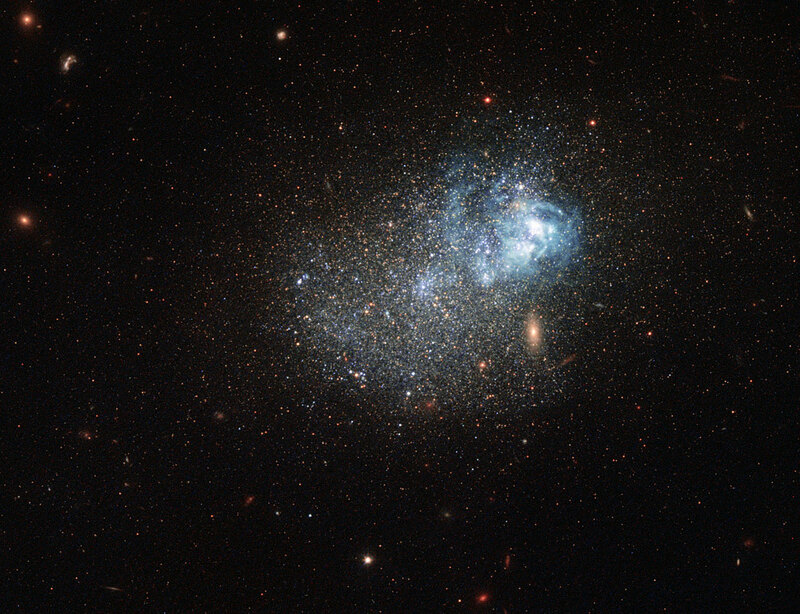 Both classes are also deemed “early-type” galaxies, because they are evolving passively. However, while elliptical galaxies may be passively evolving when we observe them, they have usually had violent interactions with other galaxies in their past. 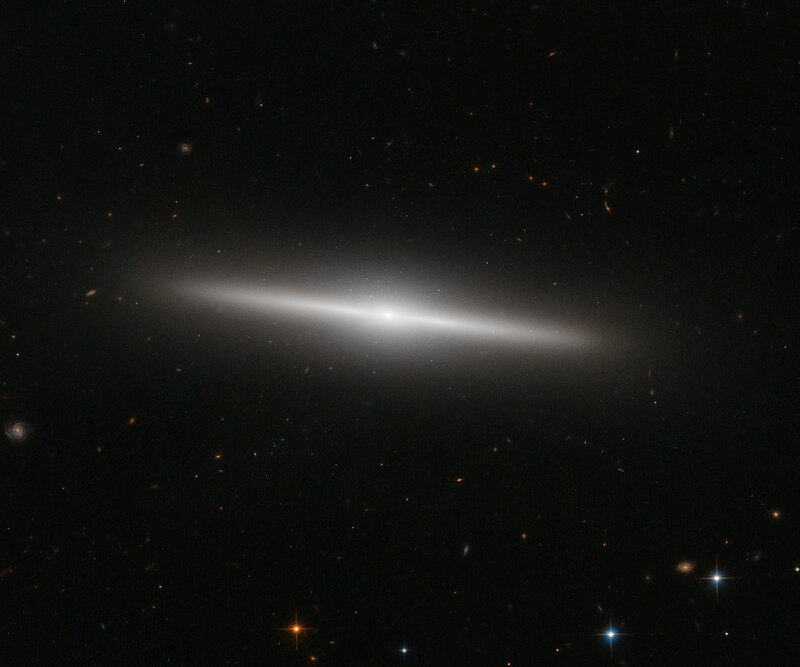 In contrast, S0 galaxies are either aging and fading spiral galaxies, which never had any interactions with other galaxies, or they are the aging result of a single merger between two spiral galaxies in the past. The exact nature of these galaxies is still a matter of debate. 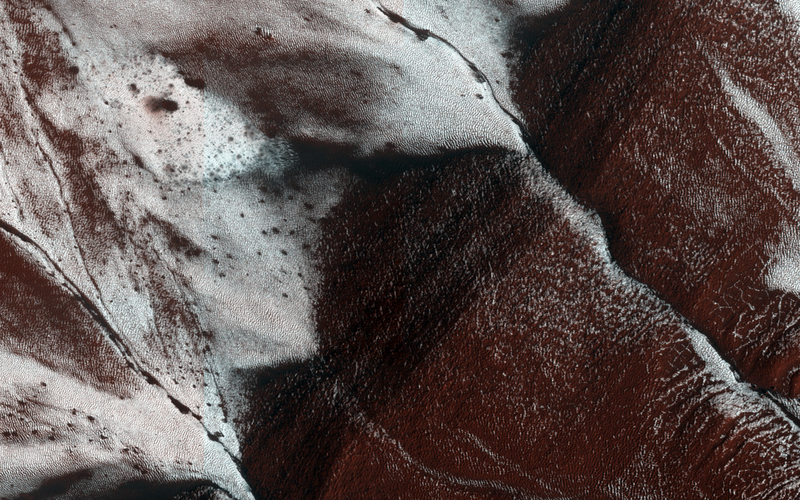 This image of an area on the surface of Mars, approximately 1.5 by 3 kilometers in size, shows frosted gullies on a south-facing slope within a crater. At this time of year, only south-facing slopes retain the frost, while the north-facing slopes have melted. Gullies are not the only active geologic process going on here. A small crater is visible at the bottom of the slope. The image was acquired on Nov. 30, 2014, by the High Resolution Imaging Science Experiment (HiRISE) camera, one of six instruments on NASA’s Mars Reconnaissance Orbiter. The University of Arizona, Tucson, operates HiRISE, which was built by Ball Aerospace & Technologies Corp., Boulder, Colorado. NASA’s Jet Propulsion Laboratory, a division of the California Institute of Technology in Pasadena, manages the Mars Reconnaissance Orbiter Project for NASA’s Science Mission Directorate, Washington. 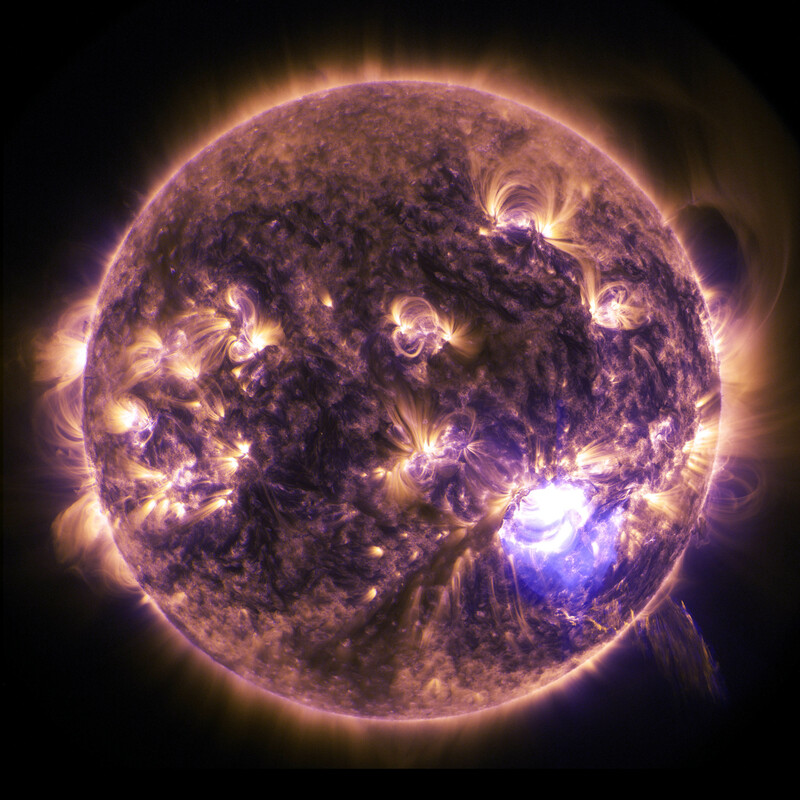 December 20, 2014 marks NASA Ames Research Center’s 75th Anniversary. The center was established in 1939 as the second laboratory of the National Advisory Committee for Aeronautics, and was named for the chair of the NACA, Joseph S. Ames. It was located at Moffett Field in Sunnyvale, California, now at the heart of Silicon Valley. The Laboratory was renamed the NASA Ames Research Center with the formation of NASA in 1958. 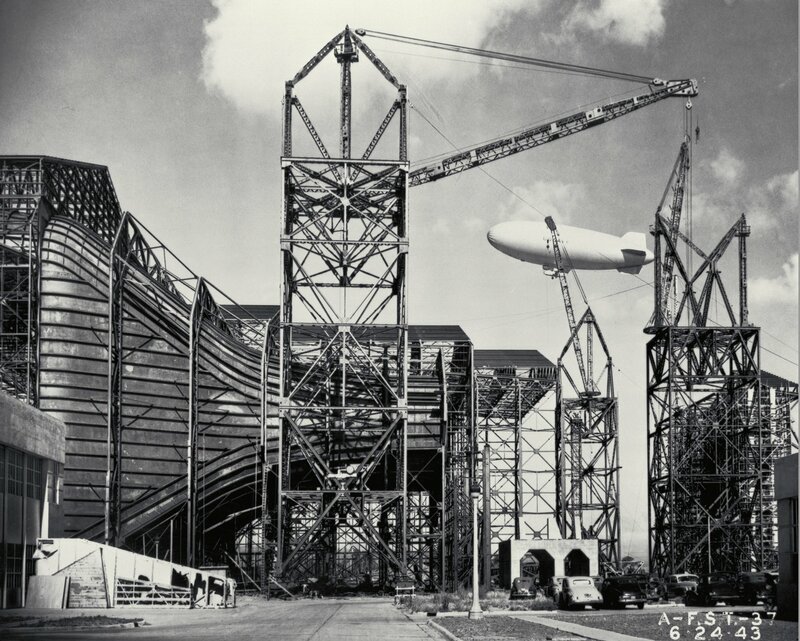 This June 2, 1943 photograph shows the construction of the Ames full-scale 40- by 80-foot wind tunnel, with a side view of the entrance cone and a blimp in the background. 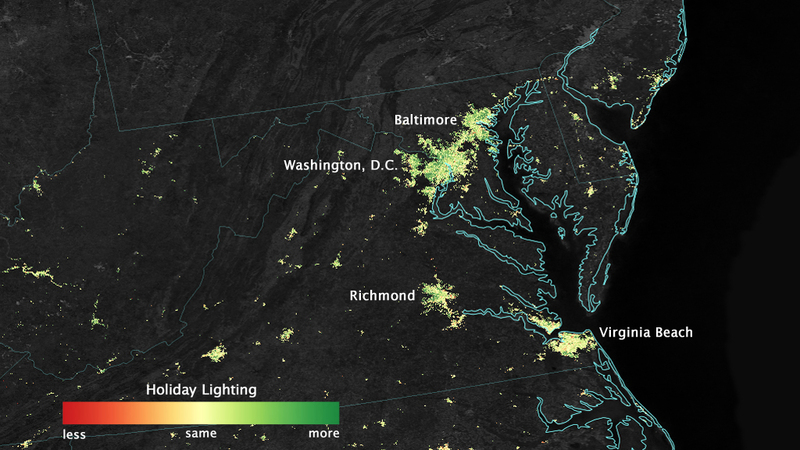 City lights shine brighter during the holidays when compared with the rest of the year, as shown using a new analysis of daily data from the NASA-NOAA Suomi National Polar-orbiting Partnership (Suomi NPP) satellite. Dark green pixels are areas where lights are 50 percent brighter, or more, during December. This new analysis of holiday lights uses an advanced algorithm, developed at NASA’s Goddard Space Flight Center in Greenbelt, Maryland, that filters out moonlight, clouds and airborne particles in order to isolate city lights on a daily basis. The data from this algorithm provide high-quality satellite information on light output across the globe, allowing scientists to track when – and how brightly – people illuminate the night. A daily global dynamic dataset of nighttime lights is a new way for researchers to understand the broad societal forces impacting energy decisions and to look at how people use cities, from an energy perspective. 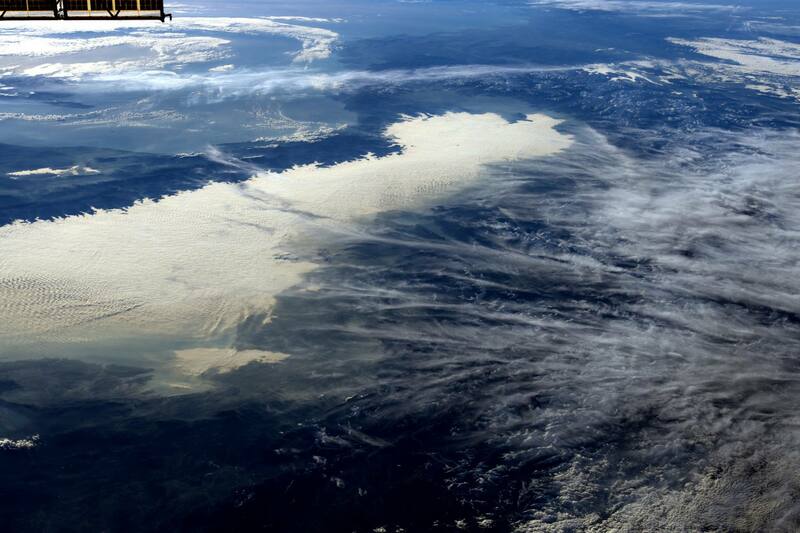 From the International Space Station, Expedition 42 Flight Engineer Terry W. Virts took this photograph of the Gulf of Mexico and U.S. Gulf Coast at sunset and posted it to social media on Dec. 14, 2014. 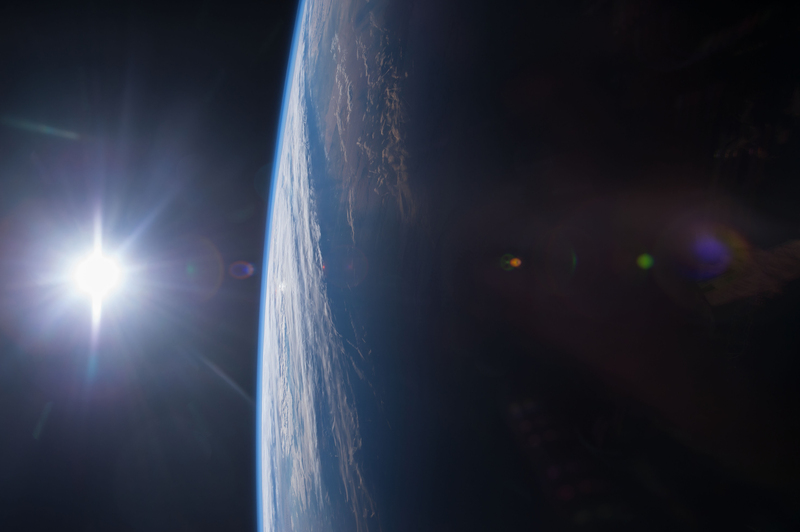 The space station and its crew orbit Earth from an altitude of 220 miles, traveling at a speed of approximately 17,500 miles per hour. Because the station completes each trip around the globe in about 92 minutes, the crew experiences 16 sunrises and sunsets each day. 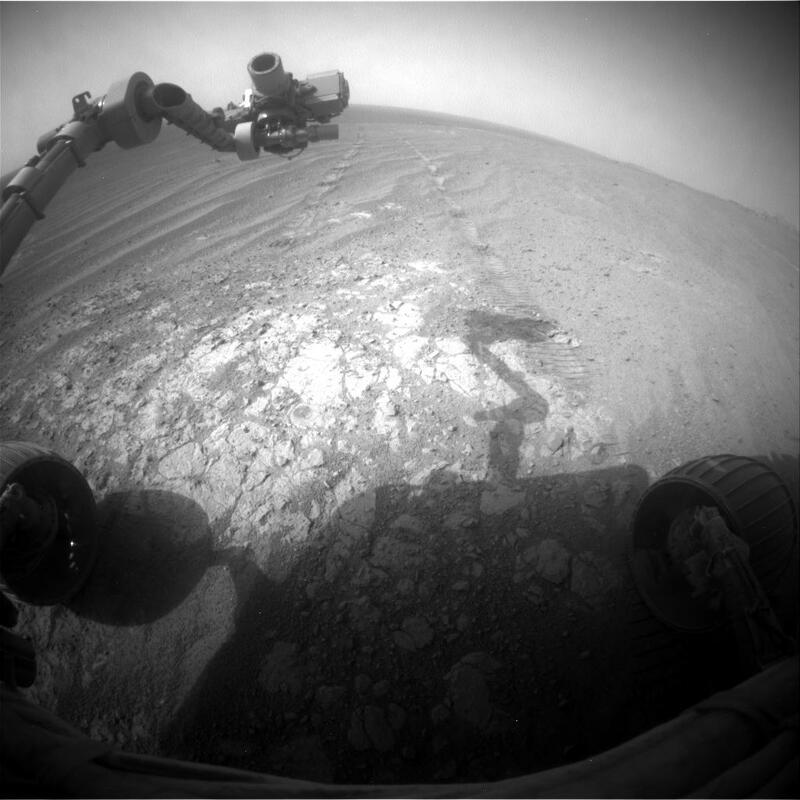 NASA’s Mars Exploration Rover Opportunity is continuing its traverse southward on the western rim of Endeavour Crater during the fall of 2014, stopping to investigate targets of scientific interest along way. This view is from Opportunity’s front hazard avoidance camera on Nov. 26, 2014, during the 3,854th Martian day, or sol, of the rover’s work on Mars. This camera is mounted low on the rover and has a wide-angle lens. The scene includes Opportunity’s robotic arm, called the “instrument deployment device,” at upper left. Portions of the pale bedrock exposed on the ground in front of the rover are within the arm’s reach. Researchers used instruments on the arm to examine a target called “Calera” on this patch of bedrock. The wheel tracks in the scene are from the drive — in reverse — to this location, a drive of 32.5 feet (9.9 meters) on Sol 3846 (Nov. 18, 2014).